Summary: An Abstract of Title for land in the township of Dumfries prepared by the Registrar for Brant County in 1855. On the 5th February, 1798, Colonel Brant, on behalf of the Six Nations acting as their legal attorney, sold to Philip Stedman of Niagara, that portion of their lands known as Block No. One, comprising 94,305 acres, and which, by an Act of the Legislature of the Province, became known as the Township of Dumfries. The stipulated price was £8,841. However at the time when John and Susannah Sparkman sold the land to Thomas Clark no part of the principal money agreed upon with Philip Stedman had been paid. Clark took out a mortgage on the lands to the Indian Trustees for the payment of the £8,841 and interest. REGISTRY OFFICE COUNTY of BRANT.C.W. An Abstract of Title of Lot number 7 on the W side of Grand River street, in the Town of Paris, County of Brant and Province of Ontario, which said lot is supposed to be composed of a part of lot number 30 in the 1st Concession of the Township of South Dumfries. 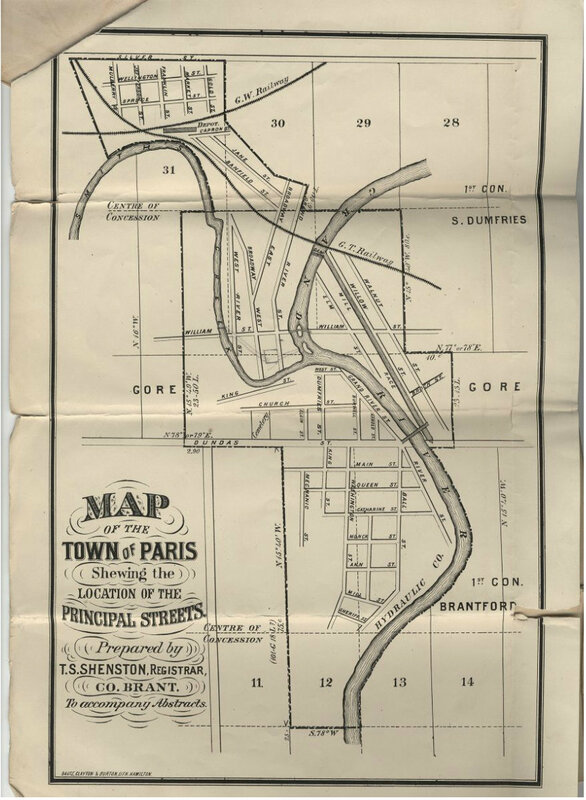 The Town of Paris became incorporated May 19th, 1855, 18th Victoria, Chapter 148, and the boundaries, a[s] therein described, embrace a part of lots 29, 30, and 31 in the 1st Concession of the TOWNSHIP OF SOUTH DUMFRIES, a part of lots No. 12 and 13 in the 1st Concession of the TOWNSHIP OF BRANTFORD, and a part of the “GORE NORTH of DUNDAS STREET,” lying between the two above named Townships, all of which are delineated on the annexed map. The Town being thus formed out of pars of six different Township lots, occasions great difficulty. First, to ascertain to what township lot any Town lot may have belonged previous to its becoming associated with the Town limits; and, secondly, the position of the title of such Township lot. It certainly forms no part of a Registrar’s duties to plot out maps of the properties of which he gives abstracts, and, if it was, it could not be done from the data furnished him by the descriptions in the documents he records, inasmuch as boundaries are often made of “stumps,” “trees,” “stones,” “creeks,” &c., &c. Then again, it is generally assumed that each lot contains the EXACT QUANTITY of land named in the patent, whereas in fact almost every lot FALLS SHORT or OVER RUNS a goodly number of acres. 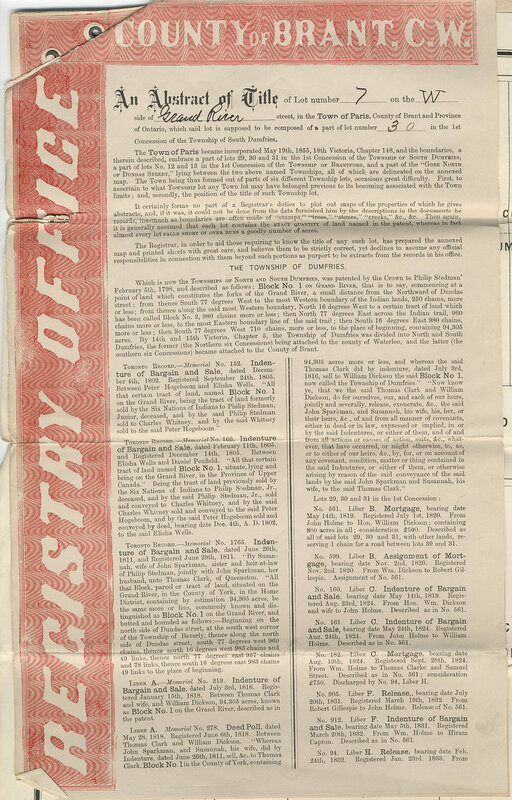 The Registrar, in order to aid those requiring to know the title of any such lot, has prepared the annexed map and printed sheets with great care, and believes them to be strictly correct, yet declines to assume any official responsibilities in connection with them beyond such portions as purport to be extracts from the records in his office. Which is now the TOWNSHIP OF NORTH AND SOUTH DUMFRIES, was patented by the Crown to Philip Stedman’ February 5th, 1798, and described as follows : Block No. 1 on GRAND RIVER, that is to say, commencing at a point of land which constitutes the forks of the Grand River, a small distance from the Northward of Dundas street; from thence South 77 degrees West to the most Western boundary of the Indian lands, 250 chams, more or less; from thence along the said most Western boundary, North 16 degrees West to a certain tract of land which has been called Block No. 2, 980 chains more or less; then North 77 degrees East across the Indian trail, 960 chains more or less, to the most Eastern boundary line of the said trail; then South 16 degrees East 980 chains, more or less; then South 77 degrees West 710 chains, more or less, to the place of beginning, containing 94,305 acres. By 14th and 15th Victoria, Chapter 5, the Township of Dumfries was divided into North and South Dumfries, the former (the Northern six Concessions) being attached to the county of Waterloo, and the latter (the southern six Concessions) became attached to the County of Brant. TORONTO RECORD.- Memorial No. 166. Indenture of Bargain and Sale, dated February 11th, 1805. and Registered December 14th, 1805. Between Elisha Wells and Daniel Penfield. “All that certain tract of land named Block No. 1, situate, lying and being on the Grand River, in the Province of Upper Canada." Being the tract of land previously sold by the Six Nations of Indians to Philip Steadman Jr., deceased, and by the said Philip Stedman, Jr., sold and conveyed to Charles Whitney, and by the said Charles Whitney sold and conveyed to the said Peter Hogeboom, and by the said Peter Hogeboom sold and conveyed by deed, bearing date Dec. 4th A.D. 1802, to the said Elisha Wells. TORONTO RECORD.- Memorial No. 1765. Indenture of Bargain and Sale, dated June 26th, 1811, and Registered June 29th, 1811. “By Susannah, wife of John Sparkman, sister and heir-at-law of Philip Stedman, jointly with John Sparkman, her husband, unto Thomas Clark, of Queenston. “All that Block, parcel or tract of land, situated on the Grand River, in the County of York, in the Home District, containing by estimation 94,305 acres, be the same more or less, commonly known and distinguished as Block No. 1 on the Grand River, and butted and bounded as follows :- Beginning on the north side of Dundas street, at the south west corner of the Township of Beverly, thence along the north side of Dundas street, south 77 degrees west 960 chains, thence north 16 degrees west 983 chains and 49 link, thence north 77 degrees east 957 chains and 78 links, thence south 16 degrees east 983 chains 49 links to the place of beginning. LIBER A.- Memorial No. 219. Indenture of Bargain and Sale dated July 3rd, 1816. Registered January 15th, 1818. Between Thomas Clark and wife, and William Dickson, 94,305 acres, known as Block No. 1 on the Grand River, described as in the patent. The foregoing are the only entries described as affecting the above named Lots previous to the incorporation of the Town of Paris (May 10th, 1855) since which time all entries affecting the Town of Paris have been kept separately. I hereby certify to the correctness of the foregoing 1800 words. James Young Reminiscences of the Early History of Galt and the Settlement of Dumfries in the Province of Ontario, 1880. Pages 13-15.